~~ Isaiah 64:8 (NIV84) ~~ Yet, O Lord, you are our Father. We are the clay, you are the potter; we are all the work of your hand. 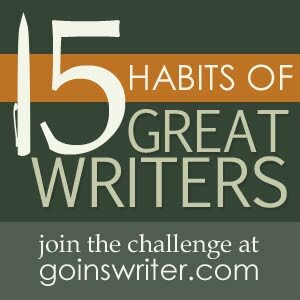 It’s day seven of the 15 Habits of Great Writers challenge. Just to recap for those new to this series, so far the habits we’ve talked about are: Declare, Believe, Initiate, Practice, Prepare and Steal. Everything I’ve ever written starts out ugly. If that’s the sign of a great writer, I’m off to a good start. Each time I get a first draft done and think to myself “This one is sooooo very much a lost cause. Toss this one into the waste paper basket now. Let it die a quiet and peaceful death. Don’t let it suffer by keeping it alive.” But, each time I have to follow my stubborn instincts and keep trying to improve on it. The idea of quitting is a thought that just makes me crazy. It’s like a beast that I have to conquer just so I can say “Ha. I knew I could do it. I told you so!” By the time a work is finished; it turns out to be a creation that I didn’t know I had in me to write. Many times when I am done it is a whole different creature than what I had started out to construct. I always pray and ask God to lead me in my writing; to use me to write a great message that can touch others and bless them. Each time, I complete a work and I see how it turned out; how well the thought process flows, and the logic behind it my first thought always is “Wow, this is incredible Lord. I wish I would have thought of it. I could have written something like this myself.” But wait! I just did. And, I guess that’s the point of starting out ugly. When the final polish is applied, the end product is exciting; and accomplishment is something to be proud of. Quite often, when I am in a depression episode, I have gone back to read things I have written in the past. Reading the feedback that I received helps to inspire me; to remind me of how God is using me to bless others. This, in turn, blesses me. I have often forgotten lesson’s that I’ve learned and written about. As I reread journals, stories, and blogs I wrote I am reminded of the lessons I was taught with them at the time. I get re-motivated by my own work. It’s as though I’m seeing it for the first time, again. Again, I am reminded how much God loves me. He never gives up on me, even though He has plenty of just cause to do that if He should choose to. Each time that He uses my own words to remind me of the lesson learned, there is just a little more of an improvement than there was the first time around. He guides me to make a work that can help others, and then uses it to help me too. He helps me write pieces that start out as something ugly. With each series of revisions it is being molded to be something more beautiful... just as He is doing with my heart and my life. Slowly I’m becoming the person He wants me to be; beautiful just like Jesus. ~~ Dear God ~~ Thank You for each revision that You make in my life, and in my work. I started out ugly, but slowly I am becoming a beautiful work of art. Please use me to bless others, and to show Your glory always. In Jesus name, AMEN. Great Writers Series: I Am A Writer!